A master of metamorphoses, Vik Muniz (Brazilian, Born 1961) presents familiar yet startling reconstructions combining drawing, sculpture, and photography. Over twenty years, Muniz has gained international renown for masterfully creating reproductions from the canons of art history and the archives of popular culture. His reconstructions are created from nontraditional materials such as soil, chocolate syrup, magazine clippings, industrial refuse, garbage, and diamonds. Muniz successfully juggles both the function and meaning of the materials, coaxing interplay between the two. Viewers may delight in the ingenuity of the constructed image, and delve into multiple layers of meaning. His first profession was in advertising, but after moving to the United States in the late 1980s, Muniz began to make sculptures. Eventually, he found the medium of photography to be most satisfying because he could capture the ideal image of the sculptural objects and drawings he created. Photography became his tool for securing a particular point of view, while orchestrating the concept behind his constructions. For example, in 1995 Muniz created a simulation of the 20th century photographer Alfred Steiglitz’s Equivalents on view at the Museum of Modern Art (MoMA) by photographing the marble floors of MoMA, using simple props—painted coins and paper—transforming the floor to resemble Steiglitz’s sky and fleeting clouds. By contrast, the Pictures of Chocolate series is created with speed and precision using viscous chocolate syrup. Muniz recreates the famous French painter Jean-Honoré Fragonard ‘s The Reader, an 18th century portrait of a young woman reading a novel, in chocolate. The bravura of Fragonard’s brushstrokes is mimicked by Muniz’s deft markings on white Plexiglas. In 2001, Muniz was invited to represent Brazil in the Venice Biennale, where he exhibited the Pictures of Color series. Utilizing thousands of Pantone color swatches, Muniz creates the appearance of digitized images of known works of art. Among the series is an interpretation of French painter Claude Monet’s famous 19th century work Haystack, which is a study of the effects of light and atmosphere on forms. 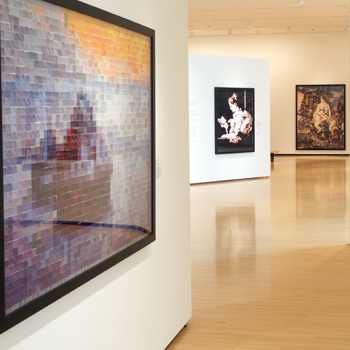 Muniz likens the pixels in digital photography to Monet’s impressionist brushstrokes. Given access to thousands of diamonds, Muniz created dazzling portraits of Hollywood’s silver screen divas: Marilyn Monroe, Bette Davis, and Marlene Dietrich. He tested the “degree of interference between the overkill glamour of the stars themselves and that of shiny rocks.” These mesmerizing portraits of some of the 20th century’s most celebrated actresses seem to cast a glittering, eternal afterimage. The images of the divas, as well as his photographs constructed from a confetti-like collage of magazine clippings, hint at Muniz’s interest in the media. Working in a variety of scales—from the minute to the monumental –is also an essential component of his repertoire. Muniz describes his approach: “There are two narratives of scale that take place as we approach an image on a wall; one that is physical, that implies that something seen from a distance changes as you move towards it. Another has to do with the psycho-ergonomics of having to fine-tune our cognitive apparatus to adapt to the size of things in that picture. I have made large photographs of tiny things and tiny pictures of huge things.” Three of his series, Pictures of Earthworks, Pictures of Junk, and Pictures of Garbage, are much larger than life in their original iteration. Inspired by Robert Smithson’s Spiral Jetty, Muniz creates his own humorous land sculptures of a pointing finger, an eye, a target, and a keyhole. By working with engineers and heavy equipment, he excavates and shapes tons of earth to create these massive images, which are photographed from a helicopter. For Pictures of Junk, Muniz orchestrates a tangle of objects on the floor of his massive warehouse so that chaos morphs into recognizable images of gods and goddesses from Greek mythology. To create Pictures of Garbage, Muniz collaborated with a number of workers who earn a meager wage by hand-picking recyclable materials from the dangerous mountain of garbage in South America’s largest landfill. They assisted by gathering the materials, helping select images that would be created, and arranging the objects in the studio comprising their portraits. Muniz was profoundly affected by the collaboration— “the experience with art transformed their lives and mine in the process." Vik Muniz wholly engages with the materials he arranges and transforms them into poetic objects of beauty and contemplation. Vik Muniz: Poetics of Perception is organized by the Virginia Museum of Contemporary Art, Virginia Beach, and guest curated by Carla M. Hanzal, an independent curator based in Charlotte, North Carolina. Funding for Vik Muniz: Poetics of Perception has been provided through a grant from Foundation for Roanoke Valley’s Arts and Culture Initiative with additional support by Member One Federal Credit Union for screenings of the award-winning documentary Waste Land, and Haywood's Jewelers for the Diamond Divas series. The Taubman Museum of Art is delighted to partner with Clean Valley Council for the exhibition’s educational programming. Vik Muniz: Poetics of Perception is on display from June 13 to September 13, 2015 in the Medical Facilities of America Gallery, the Temporary Exhibitions Gallery, and the Media Lab.